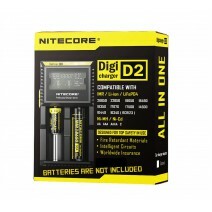 The Nitecore D2 charger uses a high-tech sensing system to recognize which type of battery you have inserted, be it the Li-ion, the Ni-MH or the Ni-Cd. It can also charge the LiFePO4 batteries but that mode has to be selected manually. The technology does not seize to amaze, but on further inspection we see that it also choses the best charging mode by itself following when it starts charging. During charging, a dedicated micro-chip is in charge of monitoring each battery slot. It has even been optimized so it can perform at its optimum levels for smaller capacity batteries. Furthermore it has an intelligent LCD display which shows all the necessary information regarding each slot such as the charging method selected, the amperes, the voltage and the amount of time. The D2 has a very useful function for charging in dark places when you don’t want to get disturbed by its light, when activated the lights are dimmed for ultimate relaxation to the user. This super charger also has another amazing function, it turns off the battery charging by itself when the battery is charged to its peak, keeping you and the batteries safe. Nitecore has had it globally insured, so no matter where on earth you are right now, you are covered. Safety is always a priority with Nitecore and thus this product features reverse polarity protection. We all know that batteries and chargers can get hot when charging, to mitigate any risk the heat poses the charger has been designed so heat can be dissipated away from the mains very efficiently. Compatibility work with almost all types of batteries (IMR, Li-ion, Ni-MH/Ni-Cd and lifePO4). 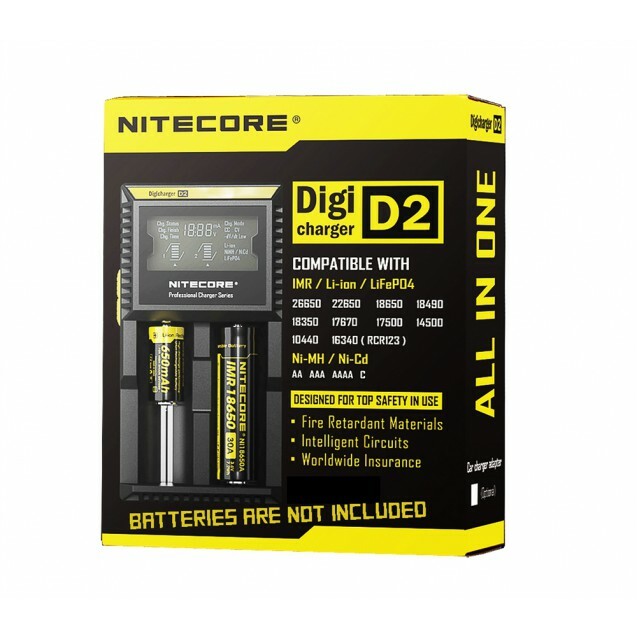 Product Description With the introduction of the Nitecore.. The iJoy High Drain Rechargeable Battery comes with a 3750mA..